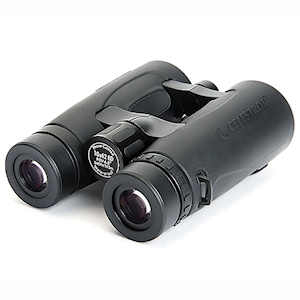 Celestron Granite 8x42 Binoculars are made with birders in mind using Extra-low Dispersion (ED) glass for reduced chromatic aberration, enhanced resolution, and maximum color fidelity. You will appreciate the large 426-foot field of view at 1000 yards, and the 6½-foot minimum close focus, so you won't miss anything in the field. Celestron’s Granite ED Binoculars feature phase and dielectric coatings on their BaK-4 glass prisms plus fully multi-coated optics, providing maximum light transmission and razor-sharp image quality. Despite full rubber armoring, the 8x42 Granite ED binocular weighs just 24 ounces, and with its ergonomic open bridge design, it’s very comfortable in your hands.